Kettering Town produced a second-half horror show as 10-man Biggleswade Town inflicted a damaging 3-2 defeat at Latimer Park. 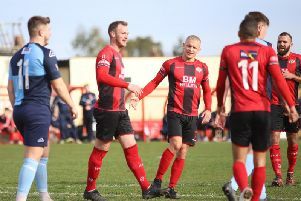 In the first of the Poppies’ three games in hand on Evo-Stik League South Premier Division Central leaders Stourbridge, they were simply found wanting as their title hopes suffered a potentially significant setback. Things had looked good at half-time. Marcus Law’s team played themselves into the contest and were a goal to the good thanks to Dan Holman’s near-post header. But it was a different story after the break as Biggleswade came out firing and then continued to outwork their hosts, even when they were reduced to 10 men with the scores level at 1-1. Defensively, the Poppies were hapless. But, more worryingly, they were outworked by the visitors who won almost every second ball and gave Kettering a sobering lesson in hard work and desire. The damage was all done in a brutal 20-minute period and the Poppies had no response until it was far too late. Quite how damaging this loss will be to their title hopes remains to be seen. But the way it came about will surely be the most concerning thing for Law and the 617 souls who came along with expectations of something completely different to what was served up. Biggleswade started brightly and went close when Matt Ball took aim from 25 yards and fired a shot narrowly wide with Paul White scrambling across his goal. Slowly but surely, the Poppies grew into the contest and they took the lead on 26 minutes. Biggleswade goalkeeper Sam Donkin, who once plied his trade at Corby Town, palmed a tame effort from Lindon Meikle away for a corner. Marcus Kelly delivered it to the near post and Holman threw himself with his diving header finding the intended target. And, from there, the Poppies looked the more likely to add to their lead. Holman fired over after a mistake from Tom Smith and then, on the stroke of half-time, Donkin produced a good stop at point-blank range to deny Declan Towers who got on the end of another Kelly corner. But no-one could have envisaged what would happen after the break. Biggleswade came out of the traps quickly and won a corner and scored from it inside the first minute of the second period. The set-piece wasn’t dealt with, a dreadful clearance fell at the feet of Ball on the edge of the area and he had all the time in the world to pick his spot with a low finish into the bottom corner. Biggleswade had their tails up after that but their own hopes were hit on 49 minutes when Soloman Nwaboukei went flying into Ben Milnes on the near touchline. It was a challenge that was worth a couple of red cards and referee Elliot Kaye wasted little time in delivering the appropriate punishment. But that only seemed to fire Biggleswade up and they maintained their course while the Poppies crumbled in front of them. The impressive Joe White, who led the line so well for the visitors, seized on a loose header and saw his shot deflected over before Jordan Gent headed the resulting corner over the bar. But Biggleswade did take the lead just past the hour when Craig Stanley was penalised for a foul on Jonny McNamara on the edge of the area. And Ben Walster stepped up to curl a fine free-kick into the top corner with Paul White rooted to the spot. And things only got a whole lot worse for the Poppies five minutes later when the defence fell asleep again and Joe White coolly rolled the ball beyond his namesake to give the 10 men a two-goal advantage. The Poppies looked lost after that as they struggled to break down a resolute defence while too often resorting to long balls into the area that were swallowed up by the Biggleswade centre-halves. The pressure did increase late on with Aaron O’Connor forcing Donkin into a smart save after a neat turn before David Longe-King produced a heroic block to deny Meikle after he had exchanged passes with O’Connor. A miserable second half was summed up when Rhys Hoenes was sent-off in stoppage-time for simulation in the penalty area after he had previously been booked for dissent. There was time for Marcus Kelly to sweep home a late consolation after Donkin had saved another effort from O’Connor but that proved to be the final play of the game. It was 45 minutes that Law and his players will want to forget quickly and they will need to find an instant response when Royston Town come calling at the weekend. Poppies: P White; Kelly-Evans, Towers, Stanley, Kelly; Stohrer (sub Toseland, 69 mins), Milnes, Meikle; O’Connor, Holman, Hoenes. Subs not used: Solkhon, Graham, B Bradshaw, Rowe-Turner. Biggleswade: Donkin; J Bradshaw, Longe-King, Smith (sub Gent, 51 mins), Walster; Forbes, Makoma; McNamara, Nwaboukei, Ball (sub Bell, 78 mins); J White. Subs not used: Donnelly, Brooks, Allinson. Goals: Holman (26 mins, 1-0), Ball (46 mins, 1-1), Walster (62 mins, 1-2), J White (67 mins, 1-3), Kelly (90 mins, 2-3). Bookings: Hoenes (dissent), J White (foul). Sendings-off: Nwaboukei (serious foul play), Hoenes (second bookable offence). The Raj (www.therajrestaurant.net) man-of-the-match: Dan Holman - While too many of the Kettering players went missing in the second half, Holman was one who continued to work his socks off to try to make things happen. A constant livewire, he scored with his first clear chance and always looked a threat, even during a miserable second period.